This piece would look so different if I were writing it in the 1991-1992 offseason. (For one, you’d be holding it in your grubby paws as a newspaper.) But over the decade span preceding that offseason, Washington had three Super Bowl titles in four appearances, made the playoffs seven times in 10 years, and was one of the model NFL franchises. But this isn’t 1992 by a long shot, and over the last 10 years, the model Washington has put together is not a good one. The team has two playoff appearances since 2009, losing in the Wild Card Round after a division title in both 2012 and 2015, and has only one winning season besides those, with no other finishes higher than third place. Even their title seasons weren’t that impressive, topping out at 10-6 in 2012. And now, with uncertain futures at almost every position, things aren’t starting off well for the next 10 years, either. 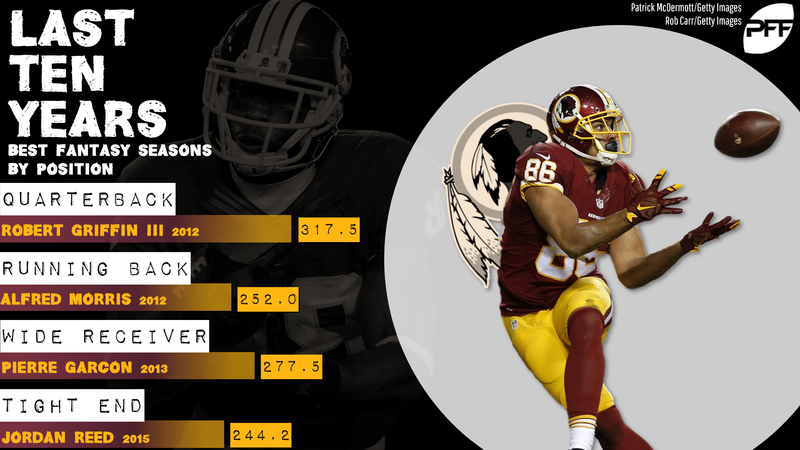 Let’s take a look at the best Washington fantasy seasons of the last decade. It’s easy to forget now, since things afterward didn’t go so well, just how good Griffin’s rookie season was. He finished ahead of both Andrew Luck and Russell Wilson on the fantasy leaderboard in their collective rookie campaigns (and all three were QB1 finishers) and won the Offensive Rookie of the Year crown. The Luck/Griffin conversation had dominated the talk of that year’s draft, and it wasn’t really settled by the end of the year, either. Things went off the rails, both for Griffin and Washington, after that, but don’t ever forget just how cool his 2012 run was. Speaking of Washington rookies in 2012 who never lived up to that hype again, here’s Morris. He was still good in 2013 and 2014, topping 175 PPR points both years, but his rookie 2012 was the best running back season of Washington’s last decade by more than 60 points (Adrian Peterson’s 2018 somewhat incredibly comes in second). Morris was never a receiving threat — he’s been in the league seven years and still doesn’t have a receiving touchdown — but as a runner, and with a massive, 335-carry workload, his rookie season was incredibly productive. The Washington offense under Kyle Shanahan was something else, man. It wasn’t that the team was that much more productive with Shanahan than without (Washington averaged 340 points per year in four years with Shanahan as the OC, 329 in the six other years over this decade span), but it just lent itself so much more to fantasy production, with the top quarterback, running back, and wide receiver season in the last decade coming with Shanahan at the helm. After battling injury his first two years, Reed was mostly healthy in 2015 and put together a monster season. It should have led to a long stretch of productivity. Instead, he’s missed almost six games a year in the three seasons since then and has 10 total touchdowns in the three years since 11 scores in 2015. He still turns only 29 this year, and tight ends age better than the other skill positions, so time hasn’t run out on Reed matching or coming close to that 2015 season, but at this point you probably need to bet against that.